Welcoming participants to the third Brussels Development briefing, Ferdinand Nyabenda of the ACP Secretariat and Lluis Riera of the European Commission offered important elements to for reflection and debate, setting the context and the tone of the discussion. Representing the ACP Group, Mr. Nyabenda stated that aid for trade is a need for the African, Caribbean and Pacific countries. In the framework of the Doha round and the EPA negotiations, aid for trade has the potential to bring concrete benefits to developing countries, especially in sectors such as agriculture. 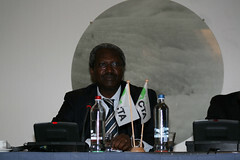 He argued that ACP countries need to have a proactive role in the debate on the aid for trade agenda. In particular, its further development and implementation need to be in line with regional integration efforts, and not necessarily linked with the signature of the EPAs. In terms of aid for trade priorities, Nyabenda argued for: technical assistance, capacity strengthening, institutional capacity and, most important, infrastructure. If properly tackled, these will allow ACP countries to benefit from trade relations and exchanges. Further, talking about the quality and quantity of aid, he said that support under the AFT agenda should be “additional aid, non conditional, sustainable and predictable.” Most important, it should be linked as much as possible with the needs on the ground, and this can only happen if the private sector and all other stakeholders are involved in a large and inclusive consultation process. Lastly, Mr. Nyabenda called upon Member States to deliver more financial resources and to foster coordination and harmonization among donors. From his side, Mr. Riera commented on three elements: the added value of the AFT agenda; its effects on agriculture; and the EC’s specific approach. He argued that the aid for trade agenda has a clear added value, as it focuses debate on what is required to allow developing countries to benefit from trade opportunities, within the framework of the WTO agreements and EPA negotiations. Further, aid for trade is key element to fostering regional integration. Broadening the discussion, he suggested that agriculture is a sector that would benefit more from regional integration – as was stressed in the ‘Advancing African Agriculture‘ initiative. In this sense, the two policies are strictly linked and interconnected. Further, the aid for trade agenda will give new momentum in the area of agriculture commodities in EC-ACP relations. Looking specifically at EC initiatives, Mr. Riera reminded participants of the important financial commitment taken to support the AFT agenda, ensuring that all ACP countries will have their share in this, and that no countries that will be “left over” in the process. He concluded by calling for good analysis of the exact requirements needed on the ground. Nevertheless, he said that the current aid for trade agenda is a good basis to move forward: aid for trade is indeed a key element to foster economic growth and promote sustainable development in ACP countries.